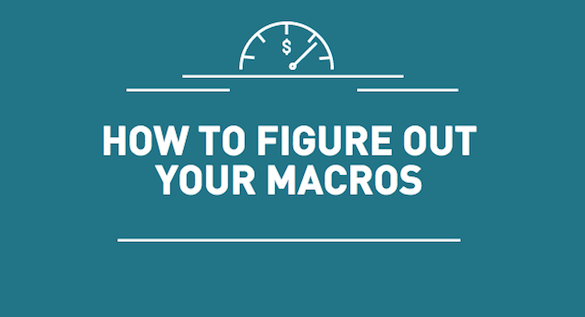 There are lots of ways to calculate your macros but you will first have to figure out your maintenance calories first. This is the number of calories you need to sustain your current weight. You can use our online calculator as a guide and then adjust from there. We’ve tried several calorie-counting apps in the past, but MyFitnessPal is one of the best. It’s the most popular health and fitness app for a reason. Best of all, it’s free so we highly suggest downloading it onto your smartphone or tablet. Click here to read our article on how to use MyFitnessPal to track your macros. Using any of the methods outlined in this article, compute your maintenance calories and test it to gauge whether or not it truly is your maintenance. Online calculators and formulas are never 100% accurate so use them as guidelines only. Once you have a set number of calories to follow, input it into your MyFitnessPal under “goals”. Hit your numbers and track your intake using the app for about 1-2 weeks. During this time you’ll also need to track your weight, along with bi-weekly progress photos. If you gain weight, then perhaps the maintenance calories you’re using are a little too high. Drop it by 100-200 calories and hit that number again for another 1-2 weeks. Do this until you don’t gain or lose weight. Once you can do that, you will have figured out your maintenance calories. Once you have your maintenance calories figured out, you can adjust it for weight gain or weight loss. For building muscle, you will have to eat slightly above maintenance. The higher above maintenance you go, the more fat you are likely to put on, along with some muscle mass and water weight. Eating more than maintenance puts you in a caloric surplus, which will aid in performance and muscle building. However, fat gain is inevitable so be prepared for that as well. Increase your calories gradually to avoid huge fluctuations in weight and/or excessive fat gain. If a caloric surplus is to gaining weight, a caloric deficit is to losing weight. Eating slightly less than maintenance calories will mean that there is a shortage of calories relative to what your body needs, so it will have to turn to other sources for fuel. This can be in the form of stored glycogen, muscle tissue, stored body fat, and etc. Drop your calories gradually—perhaps 100-200 calories at a time—to mitigate some of the negative effects associated with dieting such as extreme hunger, a decline in performance, hormonal issues, metabolic issues, and etc.